There are a lot of amazing, beautiful things about parenthood, but diaper changing isn’t one of them! In fact, it can be one of the most disgusting, nausea-inducing things you’ve ever done. However, it’s not the actual sight of the dirty diaper that makes it so unpleasant. What should be a simple enough task can actually turn out to be extremely challenging! To make this essential, yet unpleasant task a little more bearable, here you’ll discover 10 fantastic diaper changing hacks that can help. Ok, so by the smell you’re going to have already determined which type of accident you’re dealing with. However, one of the main things you discover when you have a baby, is there are various levels of poop incidents you can end up facing. Pulling the diaper a little to the side to see exactly what type of incident you need to fix, will help you adequately prepare for the task in hand. A great tip is to hold your little one’s legs while you change them. This can take a little practice as it’s not easy trying to change a diaper with one hand! However, by holding their little legs, you won’t have to deal with the nasty surprise of having poo kicked all over you! Long fingernails may look great, however, they pose two large problems. Firstly, they can scratch your babies sensitive skin, causing them to associate changing time with pain. This in turn will cause them to cry and become really distressed every time you go to change them. Secondly, long nails attract all kinds of dirt underneath them. It’s entirely possible as you change your little bundle of joy, poop will get stuck underneath your pretty nails. Not a pleasant thought and not a pleasant thing to clean off! So, while it may seem like a big sacrifice, getting rid of your long nails for a while is definitely in your best interests! It’s surprising how many things you need to start carrying around with you once you’ve had a baby. While there are some great diaper bags out there, a backpack is actually a much better choice. It has several benefits over the more traditional over-the-shoulder diaper bags. For one, it’s larger and comes with pockets so you can carry more things around, while keeping them well organised. The material is also a lot easier to clean and they can stand up on their own. The latter is actually one of the best benefits as it can be really difficult trying to hold your baby with one hand and the diaper bag with your other hand. 4. Prepare For Incoming Pee! Another unpleasant thing many parents have discovered the hard way, is little boys have a tendency to pee right as you take their dirty diaper off. If you want to avoid getting sprayed in the face, you’re going to want to have the clean diaper ready immediately. As soon as you remove the dirty diaper, quickly replace it with the clean one. Again, this is a skill you’ll get used to the more diapers you change. It’s also really worth mentioning that when you place the dirty diaper down, do it well out of baby’s reach. Babies love to grab things so as soon as they see the new diaper placed beside them, they’re going to reach right for it. Then before you know it, they’re wiping it all over themselves! Have you ever looked at your baby’s onesie and wondered what those little envelope style folds are for on the shoulders? Well, the answer might just blow you away! There’s a pretty nasty thing that can happen when you’re changing your baby, commonly referred to as a “Poonami”. It relates to those particularly messy diaper situations which end up on more than just the diaper. Usually, you’d pull the onesie up and over baby’s head to remove it, which can end up making even more of a mess; particularly on your baby! Well, those envelope style folds allow you to simply roll the onesie down from the shoulders, cleanly removing it from the bottom. The time and sanity this hack will save you will be much appreciated! One of the key struggles that comes with changing time is keeping your little one distracted. This becomes much more difficult when they reach the toddler stage! Without distraction, there’s a high chance you’ll end up dealing with a lot of mess. Toddlers in particular love to be naked So, the minute their diaper comes off, they’re going to try to make a run for it. Unfortunately, this often leads to peeing all over the couch, bed or basically anything that gets in the way. There are a lot of distractions you can use. For babies, place them onto a play mat. They’ll be so busy playing with the little hanging toys, they won’t even realise they’re being changed. For toddlers, consider giving them a tablet to play on or stick on their favourite movie. This will make changing times a lot less stressful! If your baby has an older sibling, get them involved in the changing process. Not only can they help keep your little one distracted, but they can also help with passing wipes and anything else you may need. It’s not just useful however. Older siblings (besides teenagers! ), actually like to be included in things. It helps them bond with their younger sibling and makes them feel important. So it’s a win-win situation for all involved. A pacifier can be your best friend or your enemy at changing times. It can help soothe your baby, reducing the risk of them kicking and throwing a tantrum while you’re trying to change them. However, there will be times even the much loved pacifier won’t work. In these instances, your little one will usually attempt to throw it away from them. When you’re mid change, the last thing you need is to try and retrieve the pacifier, while trying to keep hold of your baby with the other hand. A pacifier clip can eliminate this problem, ensuring it cannot be thrown away. 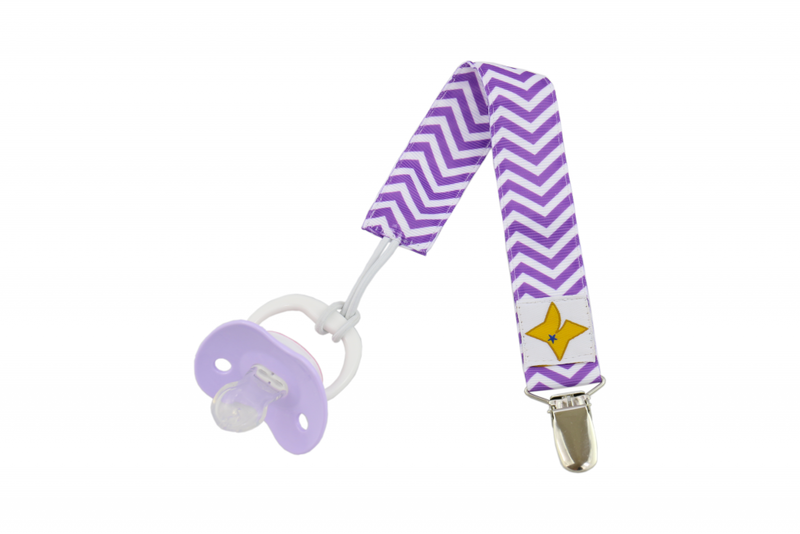 We actually have our own pacifier clips available, which you view by clicking here. Not only are they stronger and safer than others available, but our pack of 7 ensures you’ll always have one that fits perfectly with your baby’s outfit! Baby wipes are already pretty moist, but soaking them in a little water before use will make it easier to wipe poop away. It’s a very simple, yet very effective tip that can speed up the changing process and really reduce the amount of mess you need to clean up. Without going into too much detail, it won’t spread the mess across the baby’s skin as much, making it much more hygienic. Accidents during the night can and frequently do happen. To save clean-up time, have at least two layers of water-proof backed sheets on your baby’s cot or bed. That way, when one gets dirty, you can simply remove it and there will already be another clean one waiting underneath. Overall, changing times are never going to be pleasant. However, the 10 diaper hacks above will really help to minimise stress and make the clean-up process much quicker and more efficient. Do you have any of your own tips that you’ve found useful? We’d love it if you’d share them with us using the comment form below. We will all benefit from hearing what you have to say! This is the most hilarious blog that I have read here in your blogging spree. Calling it a task and indeed it is a task what with the most unexpected pee spray and one of the legs suddenly slipping from the hand and the little one digging right into you know where. My mother always said by the time a baby becomes independent a mother would have consumed that yellow stuff atleast of the size of a pingpong ball. Hope this blog reaches to many who are expecting their babies so that they do not have to consume any of that stuff. The “uneventful” circumstances during diaper changes are truly unforgettable, ha ha. Add to this the fact that for cloth diaper users, sometimes you would need to change the diaper again after a few minutes even if you have just changed it because the baby did it again. I could never forget my husband’s reaction every time he changed the baby’s diaper with poop. He puked every time, ha ha. Ha ha ha, the incoming pee is something that every parent had the chance to know what it is and how it feels. I know how is to carry a bag with diapers on us, my wife was obsessed on changing our son many times a day. All your tips are very useful and this show what a good parent you are! Thanks for sharing! So true, wallet. Every parent who had a boy would have surely experienced the burst of pee on their faces, haha. This is one of the most unforgettable moments during child-rearing. When I have conversations with my kids, we get to talk about their childhood and the hilarious things they did when they were young. It surely gives us so much to laugh about. Changing diapers is one of the major challenges most parents faces with new babies around. Some mothers are good at it but the fathers always makes a mess of the job whenever they are forced to take up diaper changing. A friend of mine tells me whenever she wants to laugh herself off, she would get her husband to do the diaper change, and she would just seat back and enjoy the horror show. These hacks here are quite cool, it’s definitely going to come in handy for parents both mothers and fathers alike. Lol! I could just imagine your friend seating on the couch laughing while her husband does the diaper change. It could be challenging for new parents but it’s not that difficult to learn, especially if one is using disposable diapers. But for cloth diapers, it’s a whole new story, haha. I remember my husband doing it at times and he would just not get the cloth nappy clipped right. When my wife was pregnant, I told her “I will do everything for the baby but do not ask me to change the diapers or clean the baby.” She agreed. However, when the baby was here, just by paternal instinct, I was changing the diapers and cleaning the baby. It has been 10 months and I still don’t know how to do this properly. Thanks for the tips.